Leading Manufacturer of ethanol distillation plant, biodiesel distillation plant, steam distillation unit, distillation column, oil distillation plants and solvent distillation from Pune. 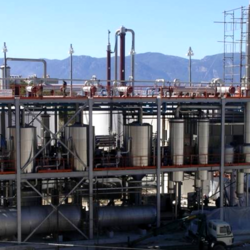 We are offering Ethanol Distillation Plant to our clients. We are offering Biodiesel Distillation Plant to our clients. Steam Distillation is a separation process for temperature sensitive substances. It is a particular type of distillation. It plays a vital role in some industrial regions. 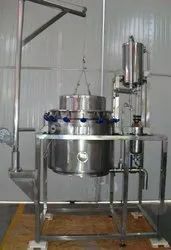 It is a physical process.Steam distillation is the preferred method used to isolate essential oils.It is also used for steam stripping in petroleum refineries and to separate commercially important organic compounds such as fatty acids.Variable capacities of steam distillation units are supplied. Distillation is process of separating liquid mixture into its component parts. There are various reasons that affects the function of column like conditions of feed, its component, internal fluid and its flow conditions. Our desigs are entirely based on needs of client. Distillation Column is used in several manufacturing industries.Variable capacities of distillation columns are supplied. Oil distillation is done in different ways depending upon type of raw material. Our plants have been supplied for widest range of oils. Oil distillation plants are used in turnkey refining plants for oil, and vegetable oils such as soya oil, sunflower oil, palm oil, corn oil, and rice bran oil. Variable capacities of oil distillation plants are supplied. Distillation equipment is used for distillation of solvent contaminated. The solvent distilled using the solvent distillation equipment is an ideal equipment best fitted for solvent reusability in industries and other commercial plants. Solvent Distillation units manufactured by us are made under superior quality material. Variable capacities of solvent distillation units are supplied. Multi Column Distillation Plant are used in pharmaceutical industries, biotechnological industries etc. Multi Column distilled water plant designed to produce 100% pyrogen free sterile distillate. Multi Column distilled water plant works on principle of interstate heat exchanger dramatically reduce consumption of heating energy and cooling water.Water for injection produced by these plants is quite economical due to low maintanance and low operational cost. Variable capacities of Multi Column Distillation Plants are supplied. 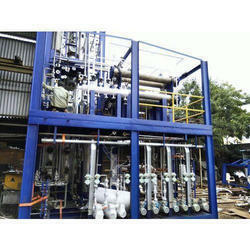 Looking for Distillation Plant ?